There are somethings in life that just make you want to sing "I'm walking on sunshine, whoa oh oh, and don't it feel good?" We definitely sing it out loud especially when looking at Corgi puppies. Eating Skittles. (Although we change it to eating "bags of sunshine".) When we destroy our LEGO cities. Saturday morning, after being able to sleep in for the first time all week. Some clothes can even make us feel this way. That pretty yellow summer dress. Clear glittery heels. 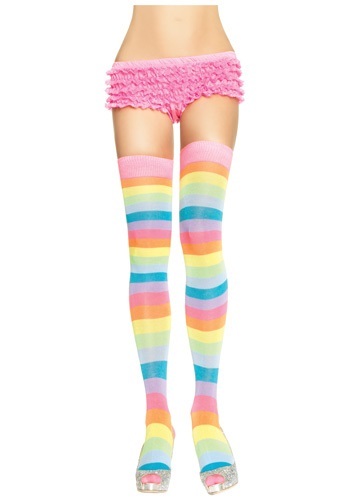 These Neon Rainbow Thigh High Stockings. Our comfy after work clothes. Really so many things make us feel like walking on sunshine. But Pair these stockings with that yellow dress and the glittery heels, on a Friday night? You might just be walking on sunshine until Monday morning. Wearing that outfit and playing with a Corgi puppy? We've lost you to the sunshine forever.